Now in two color options, the Simms Dry Creek Hip Pack is great for keeping stuff dry whether you're hiking small streams or fishing out of a boat. The Simms Dry Creek Hip Pack is one of the most popular packs with it's weather tight dry storage and quick accessibility. The hip pack does come with a removable padded shoulder strap in case you need the extra support for long distance trekking or if you packed it extra full. The magnetic retractor and hemo docking station is a handy touch so you can reach your much needed supplies at a moments notice. 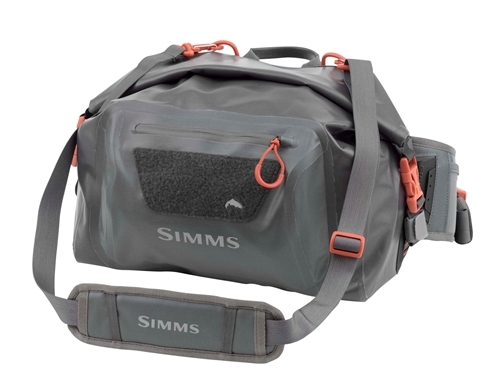 If you're going to be fishing any where that may have wet weather, you're going to want the waterproof Simms Dry Creek Hip Pack.